Fiction can be so predictable. Arguments persist as to whether there are any more than six or seven basic plots in all of literature. Star Wars is essentially Dante’s Inferno in space, Jane Eyre? Romeo and Juliet with extra tragedy but a happier ending. Lord of the Rings? A very long winded version of the Odyssey, and so on. So coming across an author who creates what seem to be genuinely new ideas is as refreshing as it is remarkable. I contend that Claire North is such an author. Let’s deal with the basics. 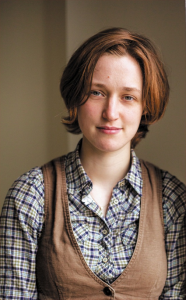 Claire North is one of two nom de plumes used by West End lighting designer Cat(herine) Webb. Having written her earliest novels for children under her real name, she moved to adult fiction but rebranded herself as Kate Griffin and then Claire North to change style again. I recently searched my local Waterstone’s for Kate Griffin books but to no avail – maybe I was looking in the wrong place as all her titles are available (but beware, there are two Kate Griffins). The best known Claire North novel is the first: The First Fifteen Lives of Harry August. I am grateful to Nickie Beharry for introducing me and the other members of our book group to this one. Time travel stories aren’t new. Our group recently read Ben Elton’s terrific Time and Time Again, for example, that centres on a time traveller going back to stop the assassination of Arch Duke Ferdinand. This was reminiscent of Stephen Fry’s Making History in which a time traveller kills off Hitler before he can do any damage… both stories are replete with unintended consequences of course. Harry August isn’t a time traveller, but he does re-live his life over and over again. Not only that, he can remember what happened last time. Sometimes he dies young, sometimes old, but he’s born into exactly the same family circumstance every time. I may be wrong, but I believe that’s a wholly original idea. Sure, from there we get into time travel tropes of altered history, the consequences of meddling with things that shouldn’t be meddled with and so on, but that kernel had me hooked from the start. The next Claire North novel I read wasn’t her second, but her third: The Sudden Appearance of Hope. This again, I believe, is anchored in an entirely original idea. Hope Arden is someone you forget. Turn away from her in conversation and by the time you turn back, she’s someone you’ve never met before. Even her parents forgot her. This makes her a flirt at parties (no luck seducing the good looking guy first time? no worries; come back in 5 minutes and try again - he’ll have no idea he’s met you before) and it makes it impossible for her to have any normal lasting friendships. It also makes her an exceptional thief and a very hard suspect for the police to catch. The Sudden Appearance of Hope includes a lot of travel and one suspects that Cat Webb has been to at least most of the places she writes into her stories (isn’t the point of being an author that you get to go to lots of exotic places in the name of research?). It’s also a strong theme in her fourth novel: The End of the Day. Our hero in this one is Charlie who gets the job as the Harbinger of Death. He gets the name of someone to go and visit, either as a warning or as a courtesy, all the necessary travel arrangements are taken care of by the office in Milton Keynes, and off he goes. There are other harbingers (famine, war and pestilence), all very ordinary people doing extra ordinary jobs for, well, super natural masters. It’s not as immediately powerful as the others, but it is more reflective. It’s much more of a social commentary than the other three. Which brings me to the last one I read: Touch. No prizes for original ideas here. A ghost moves from living host to living host through touch. When the host moves in, they take over the person completely, the underlying person is suppressed and will have no memory whatever of the time the ghost was resident – leading to some surprise in their location and condition when the host leaves. With some variation, this idea has been explored in, for example, Ghostwritten by David Mitchell, David Sheckley’s Mindswap, Iain M Banks’ Surface Detail, in the TV series Quantum leap and in the films Being John Malkovich and the apparently dreadful Fallen *. And yet… it’s first class. It’s essentially an excellent thriller, very well written with disbelief well and truly suspended early on. All four novels feature a central character with an outstanding gift/situation on which the story hangs. The protagonist finds that they are not entirely alone and come across others in the same situation as they travel the world. Cat Webb writes very well. I noticed only one point at which the fictional set up was uncomfortably weak - the bits around Hope Arden’s parents forgetting her when she was about 16. She constructs her novels with depth, she uses unusual punctuation that emphasises discontinuities and thought processes, she has great word power – but so do others. It’s the originality of those core ideas that marks her work out in my view. * I am grateful to Nolwenn Luke, Dan Brickley, Linda Humphries, Gregg Kellogg, Steven Pemberton, Tim Douglas and Liam Quinn for that list. I have to say that the ideas behind First 15 Lives, and Hope, aren’t entirely new. Have a look at ‘Replay’ by Ken Grimwood for a different take on the multiple lives idea. Or of course Life after Life by Kate Atkinson. They’re not quite the same, but the first one especially is in the same territory as 15 Lives. As for Sudden Appearance of Hope, there’s The Glamour by Chris Priest. One of the most disturbing things he’s written, and that’s saying something. Again, not exactly the same concept - Glamour features people who are invisible, i.e. they aren’t noticed - but it adds up to a similar experience. 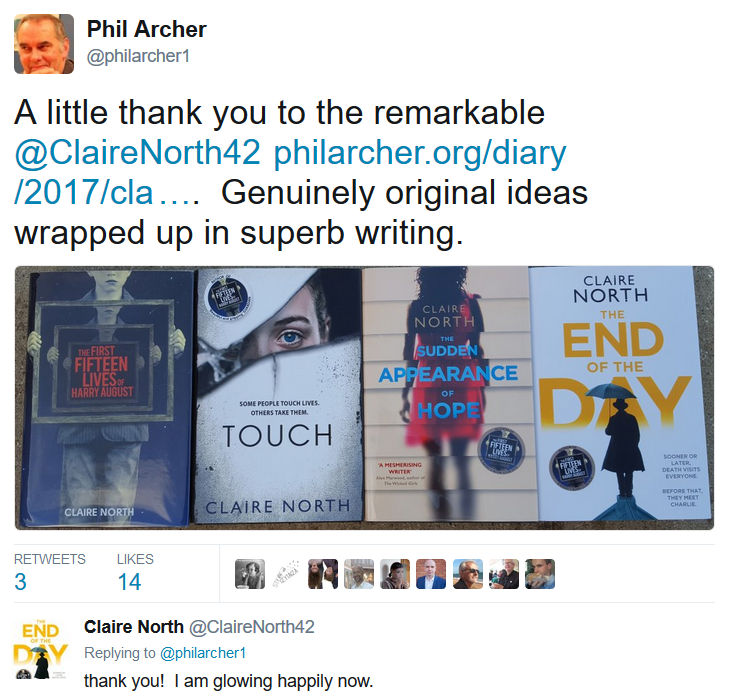 But let me say in conclusion that I’ve enjoyed the Claire North books enormously. I recently read Life After Life but didn't know about the others - I'll check them out. 84K is due out in less than a month!